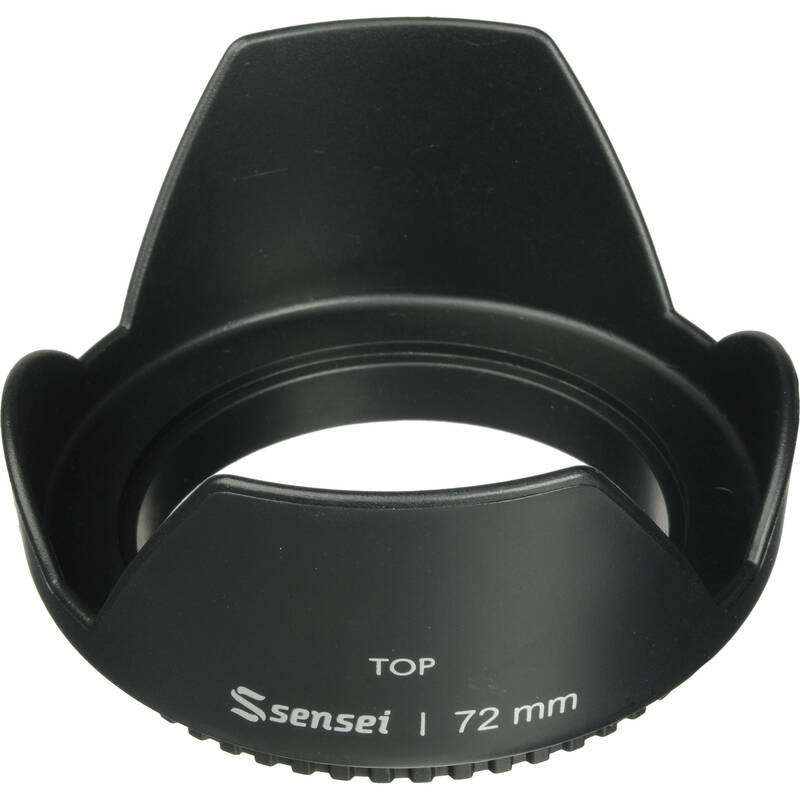 The 72mm Screw-on Tulip Lens Hood from Sensei mounts onto your camera lens to prevent glare and lens flare by blocking out stray light. The lens hood also adds shock absorption to help protect your lens from impact damage. It easily screws onto any lens with a 72mm diameter and includes a locking collar for consistent positioning. As this lens hood can be used with lenses of varying focal lengths, its tulip shape is designed to prevent vignetting while still blocking unwanted light from entering your lens. The hood is ideal for full-frame lenses with focal lengths longer than 20mm, and APS-C lenses with focal lengths longer than 15mm. Box Dimensions (LxWxH) 6.8 x 5.2 x 2.4"
72mm Screw-on Tulip Lens Hood is rated 4.3 out of 5 by 8. Rated 5 out of 5 by Speedlight from new lens hood from Sensei a working tooi THe Sensei tulip lens hood thatwe purchased is being used professionally (day in, day out) on the lens that is the longest, thus presenting the biggest target for wear and tear. The Sensei hood is probably one of the best thought out accessories that we have purchased in a long time. When you screw it onto the lens, it has a very well made separate tensioning ring to secure it in position. We have purchased a couple of other lens hoods over the years that have this feature, and are still working for us. For the fit andfinish of this product, and the well thought out design, I would have expected to pay more in the neighborhood of $20.00 for it. Would I purchase other Sensei products? Probably with preference over their competitors. Rated 2 out of 5 by Ed the aged from For me, not a good choice I have never previously used a 'screw on' hood but have lost so many 'snap ons' from rubbing aginst people and things with camera at sling that I thought I would give it a try. Disclosure > may not be using it correctly .. but .. I tinkered with it for some 30 minutes and never found a way to screw it on my Sigma 18-200 72mm lens. Not worth sending back so B&H is my favorite source of cameras and accessories so NOT a criticism of the company nor it's great personell. Rated 5 out of 5 by Ellen from Works just fine This was the only lens that needed a lens hood. I have a tulip lens hood for a different lens I use, so when I saw this one for the lens I needed it for, it was no brainer! It works just fine and the price was unbelievable at B&H. Package arrived with a couple of days and was well packaged. Great buy! Ellen P.
Rated 5 out of 5 by Cameron from Srewi Hood I use this on my telephoto lens for my Canon G1X. Flared out enough to keep the sun out of the barrel. Rated 4 out of 5 by Ulbricht from Good A bit difficult to screw onto thinner filters but does the job. Rated 5 out of 5 by David S. P. from 72mm Screw-on Tulip Lens Hood Fits my Nikon 7-200 f4 perfectly. Does it fits on a Tamron 18-400? Mine is on a Tamron 28-300. If your lense accepts 72mm filters, this lens hood will work. I use a Sensei 58mm to 72mm adapter ring to mount 72 mm filters on my Lumix 12-35 lens. This works fine, except I cannot use the original lens hood and the front glass is exposed to direct sunlight. Will this lens hood feel the bill, without vignetting? Thanks in advance. I did have some problems with the tulip design. It did show up in the picture.What I have to do is check the picture out before taking to make sure.